A NEW Teacher Clarity Workshop by Larry Ainsworth: “Learning Progressions: The Learning Targets of Daily Instruction”! Corwin’s “Learning Intentions and Success Criteria” workshop is available in both a one-day and two-day format, with the option for additional support days. This highly engaging, hands-on workshop will give educators and leaders a step-by-step, doable process to ensure that teachers are absolutely clear about what their students are to learn, why they are to learn it, and how. We have a clarity problem in our schools! We are not crystal clear about what we want our students to know and be able to do. Without clarity of learning goals that provide the sharp focus for both instruction and assessment, teachers cannot achieve the maximum possible impact on student learning. Without clarity of these learning targets, teachers may unknowingly plan instruction and design assessments that miss the mark. Clarity is essential to writing student-friendly learning intentions and success criteria. Learning intentions are what we want students to learn. They represent the “destination” of where we are going. Success Criteria are the specifics of how students will achieve the learning intentions. They provide the detailed “map” of how we are going. Learning Progressions are the “building blocks” of instruction needed to achieve the learning intention and success criteria. They provide the “Where to next?” element of the teaching and learning journey. Explain the rationale for determining learning intentions and success criteria in advance of instructional planning and assessment design. Apply the process of creating learning intentions and success criteria to a single standard in focus within a unit of study. Decide why a learning intention is important for students to learn (i.e., relevancy; larger connections to school and life). Break a learning intention into learning progressions and related success criteria. Create learning intentions, success criteria, and learning progressions for multiple standards within a unit of study of your own choosing. Create an action plan for introducing learning intentions and success criteria to students, collaborative grade- or course-level teams, school faculty, and/or the entire district. Create for students an introductory example that includes: Standard for Instructional Focus, Student-Friendly Learning Intention, Rationale, and Success Criteria. Connect learning intentions and success criteria as foundational entry points to other Corwin programs, including: Visible Learning, Common Formative Assessments 2.0, Co-Creating Student Success Criteria, Student Voice, and High-Impact Instruction. “Production Day” Workshop. After completing the two-day workshop, you can also return for an additional one or more “production days” and work collaboratively with your learning teams to create additional learning intentions, success criteria, and learning progressions for other units of study. A certified Corwin consultant will be on hand to clarify any questions, provide feedback on your work products, and offer any other assistance as needed. What Will You Leave With on Day 1? What Will You Leave With on Day 2? Agendas for both the one-day and two-day Learning Intentions and Success Criteria workshops are available upon request. 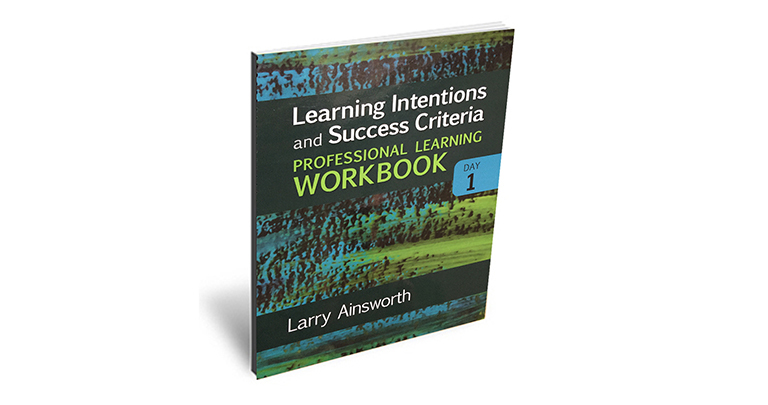 For more information about bringing the Teacher Clarity: Learning Intentions and Success Criteria Workshop to your school or district, please contact larry@larryainsworth.com.